Since our craving for raw fish wasn’t sated from the last time we went out, beloved and I decided to try out Sushi-Ya today. We always see this store open at the wee hours in the night when we get hungry and pass by the McDonald’s at Tomas Morato. We always get scared to try it out because we’re unsure if raw fish would still be fresh in the said hours of the night. We’re also unsure if they’re really open. When we got in, we saw that their service hours run until 4:30 AM on Mondays to Saturdays. It was a small store, and when I saw their menu, I found it to be pretty cheap for Japanese food in Tomas Morato. I especially found their bento box, which they labeled good for 2, to be a bargain. I also like how they made it so. You choose your main course, which you pay in full price, all of them I found affordable, and then you add 250 Php or 260 Php, depending if you want miso soup or iced tea with your bento respectively. The bento contents I’ll reserve for later, but the main course I chose was three pieces of Ebi Tempura (148 Php) with their Iced-tea good for two Bento Box (260 Php). 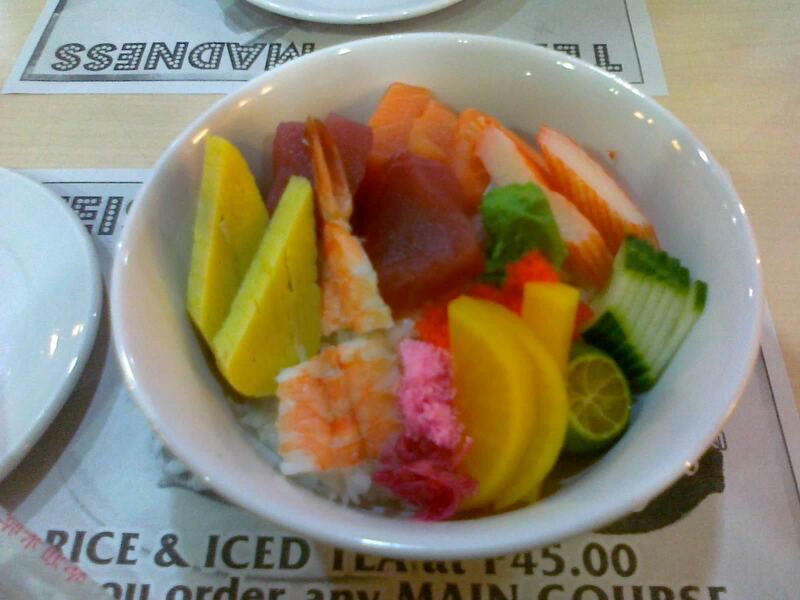 Beloved wanted sashimi, so she ordered Chirashidon (195 Php) for herself. Since beloved’s order was basically sashimi over a bowl of rice, her order came quicky. And it was as expected—sashimi over a bowl of rice. The sashimi included are tamago (egg), tuna, salmon, shrimp, and kani. There were also a couple of veggies as well: cucumber and a crunchy yellow fruit or vegetable that I thought was mango but apparently wasn’t. The tuna was pretty soft, good for what it was. The salmon wasn’t that bad as well. Our favorite sashimi was the egg—it had the perfect sweetness while maintaining an eggy taste and texture. The rice deserves applause as well; it was among the stickiest and tastiest sushi rice I’ve had in the metro. After a wait, the bento box finally came. It really was good for two. It had vegetable tempura, cucumber and tuna maki, agedashi tofu, and egg, kani, and tuna sashimi. Our main course of choice, the three pieces of ebi tempura, was there as well. In addition to that, they serve a couple of bowls of rice and a couple of glasses of refillable iced tea with the box. Quantity-wise, this was a bargain. Time for what matters, how did its components taste? The sashimi was similar to what beloved had—the tuna was soft, the kani forgetfully usual, and the tamago delicious. The tofu was covered in a delicious sweet sauce, and had a soft texture, which made it hard to get on the chopsticks, but it was worth it. The maki had the same sticky chewy rice and good for what they were. The vegetable tempura was also pretty plain. Finally, the main course, the ebi tempura was… not that good. The batter wasn’t the best I had and the shrimp was dried out. I did like the fact that the rice they served along with the box was the same rice they used for sushi—tasty and sticky. What I learned from this visit was Sushi-Ya is good for what its name says—sushi, and I guess sashimi as well. 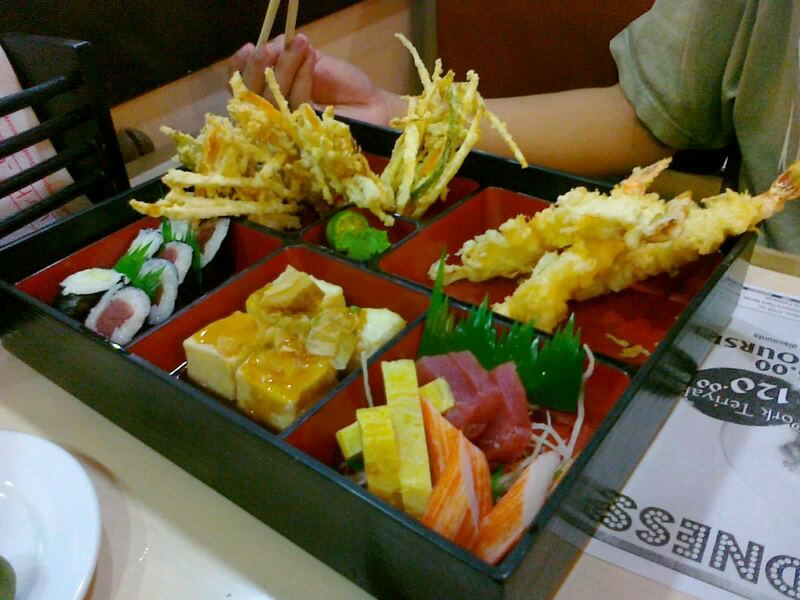 I didn’t really enjoy their tempura, although the rest of the bento box was a good deal. I guess I’d suggest to steer clear of their ebi tempura. If you want a safe bet, go for their sashimi. This place is great if you happen to be in the area at two in the morning, craving for sushi, and it’s not a Monday. Other than that, this is one of your more affordable Japanese food place that has nice sushi. Recommended for: Sushi/sashimi cravers; couples who like Japanese food. Smart nomnomnom tip: Come in twos and order their good-for-two bento.